In the not too distant past, color statement printing may have seemed too expensive or complicated for many businesses to consider. Full-color mailings were time consuming to produce and for many small to midsize companies financially out of reach. They also added a number of additional steps to the production process that ultimately inflated cost-per-piece. Times have changed. Advances in printing technology have made color the preferred option for businesses that want to develop a more engaging customer experience. By incorporating vibrant, personalized messaging in each statement, invoice and notice you send, you’re able to turn a once rudimentary engagement – sending transactional mail – into a chance to earn customer trust and deliver value. You can even unlock new revenue opportunities through adding targeted cross-sell or upsell offers directly on statements. Today's digital inkjet printers are optimized for speed, maximum throughput and higher quality print. As a result, the cost of printing in digital color is a fraction of what it was more than a decade ago. That only stands to improve as high-speed continuous feed inkjet color printers become more sophisticated and efficient. 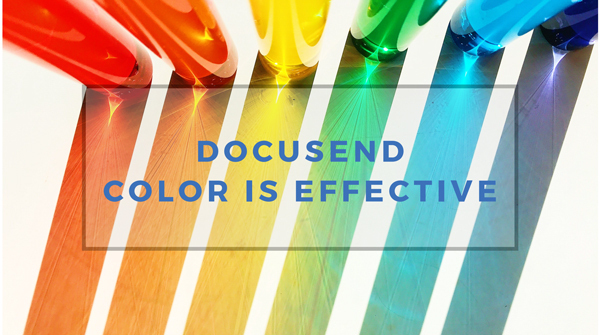 At DocuSend, we pass that efficiency on to you, our customers, giving you a low cost full color solution for invoices, statements and add on flyers / announcements.